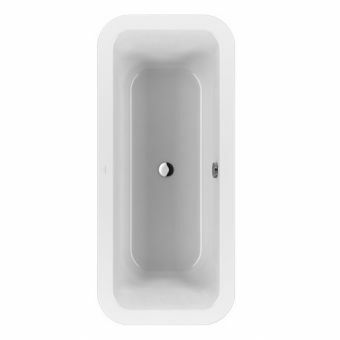 Free DeliveryVilleroy & Boch Theano Solo Freestanding BathFrom £2820.00 inc.VAT1550 x 750mm with optional electronic waste, made from patented Villeroy & Boch Quaryl solid stone luxury bathtub. 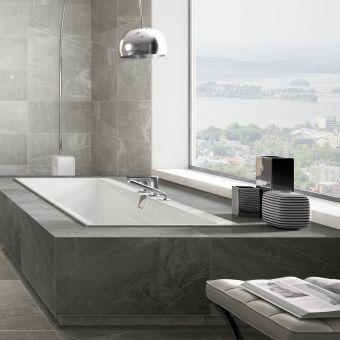 Villeroy and Boch baths boast an excellent build quality, and are created to be an absolute joy to use on a daily basis. 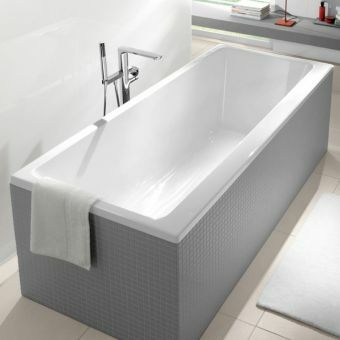 Found throughout both the domestic and business spheres, many a home and hotel suite has benefited from the inclusion of a Villeroy and Boch bath tub. The pleasure offered by a freestanding bath tub in terms of both use and aesthetics cannot be beaten, with exquisite examples on display here in the form of Aveo, Squaro Edge and the Freestanding Oval bath. Using the elegance of simplicity, these tubs feel naturally good on the skin, and retain their heat effectively to give you a long, relaxing soak. Inset baths provide the option to decorate the bathing space with tiles or panels according to taste, with numerous shapes and sizes on offer. 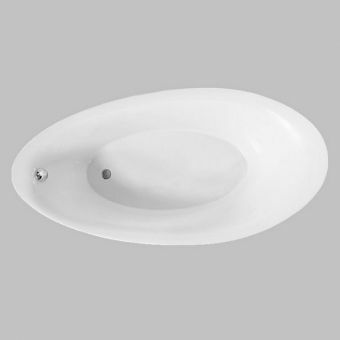 Oval baths such as the Oberon or Loop and Friends Oval baths offer a double ended option, providing total comfort for the user. There is nothing quite like sitting back and enjoying a long and relaxing bath in your very own Villeroy & Boch bathtub. Renowned the world over for their quality craftsmanship and elegant design, Villeroy & Boch is a byword for handcrafted luxury in today’s bathrooms. 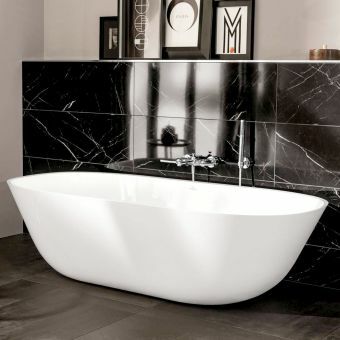 Villeroy & Boch baths are available in fixed and freestanding designs and can be manufactured from acrylic or Quaryl, a quartz and acrylic resin which provides a smooth texture with warm touch for that extra special luxurious feeling. This innovative liquid material composed of 60% quartz with acrylic resin is extremely durable, impervious to scratching and easy to clean. Lending itself naturally to the production of unique designs that are shock resistant, the pore free surface is non-slip. All Villeroy & Boch baths are tested to the highest safety standards. The rigidity of Quaryl, and the fact that it is moulded and not punched from a flat sheet of acrylic or steel, allows for tremendous design flexibility and the creation of deeper and more comfortable baths. 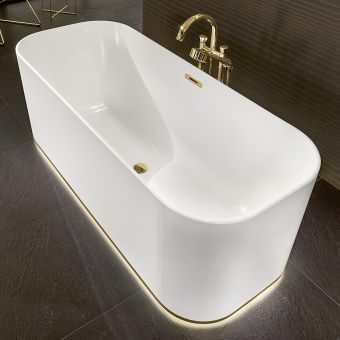 Using this proprietary material, Villeroy & Boch are able to create streamlined bathtubs with larger internal dimensions yet compact exterior footprints for a superior bathing experience. 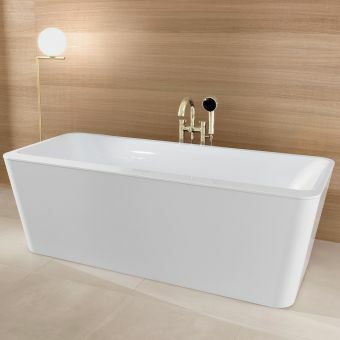 With its excellent heat insulation properties and superior skin feel, the unique aesthetics of a Villeroy & Boch Quaryl bath are the ultimate in the wellness bathroom. The bathroom is a sanctuary from the busy routine of daily life. A place to unwind and relax, the perfect wellness retreat. Villeroy & Boch strive to create a sense of peace and tranquility, creating a calming ambience essential to a healthy life. 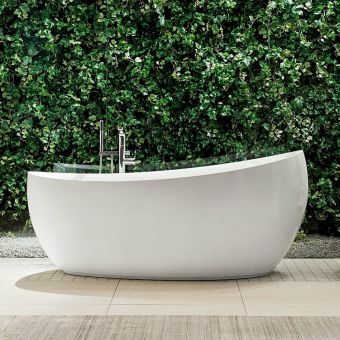 By using natural and tactile materials, Villeroy & Boch bathtubs promote a sense of ultimate wellbeing by creating a sense of relaxation through smart and thoughtful design. Innovation and performance are at the heart of the Villeroy & Boch experience. Carefully crafted for a harmonious aesthetic, the difference in a Villeroy & Boch designer bath is clear in its perfect blend of design, materials and attention to detail. That sense of luxury and quality are what makes the Villeroy & Boch bathing experience an unequalled pleasure. 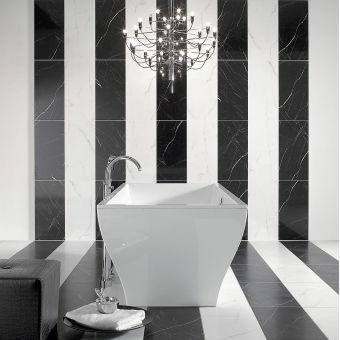 Villeroy & Boch baths boast excellent build quality making them both extremely functional and a pleasure to use. The free standing bath is simply unbeatable in aesthetic terms and creates a stunning feature in any bathroom, whether contemporary or traditional. The Aveo and Squaro Edge ranges both feature exceptional examples of this marriage of form and function, bringing elegant simplicity and an unparalleled bathing experience to your bathroom or bedroom, for the ultimate in boutique hotel bathing chic. Effortlessly creating a sense of grandeur and indulgence, a freestanding bath is the ultimate choice for the spa-like bathroom and can be mounted on a pedestal to create an even more dominant feature. Typically more expensive than an inset bath, the freestanding bath is the ultimate choice for the statement bathroom. 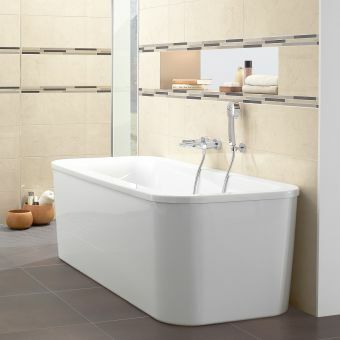 A Villeroy & Boch Quaryl freestanding bath has a number of advantages. Double skinned for superior heat retention and thermal performance, these bathtubs ensure a longer, warmer soak. 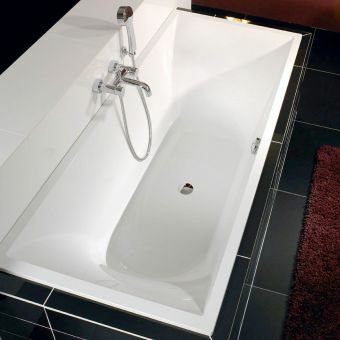 The durable quartz/acrylic material is surprisingly easy to maintain meaning these centrepiece baths are durable and long lasting, and offer a safe and non-slip bathing experience. And the sheer tactility of this beautiful material simply oozes luxury and quality. Although a freestanding bath typically requires a generously sized bathroom, freestanding bathtubs from the Loop & Friends collection come in a range of sizes that will suit a smaller family bathroom or ensuite. In fact, a freestanding bath can be surprisingly flexible in any family bathroom as the space around the tub makes it ideal for bathing younger children. Luxury, performance and versatility make a Villeroy & Boch freestanding bath the ultimate centrepiece for the modern or classically styled bathroom. By contrast, an inset bath fits seamlessly into an integrated design aesthetic where each piece in the suite works together to create a harmonious whole. Available in a wide range of sizes and shapes, and designed to work in any configuration from the busy family bathroom to the elegant ensuite, the inset bath can be decorated with a choice of tiles or panels as desired. 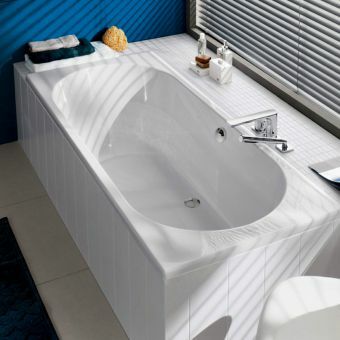 A Villeroy & Boch inset bath will fit into any size of bathroom, even where space is limited. A 1600mm Quaryl bathtub will give a pleasurable bathing experience despite its smaller footprint thanks to the generous interior dimensions of these baths. They’re also ideal for use with a wall mounted shower where space precludes a separate shower and tub. Designed to fit against a wall or into an existing alcove, the inset tub is the space saving alternative to the more lavish free standing bath. However, with Villeroy & Boch’s range of elegant and timeless inset tubs, designed to integrate seamlessly with any design brief, these luxury inset tubs offer the opportunity to create a uniquely stylish finish to any bathroom and can even be sunk, or enhanced with a step feature, to create a truly dramatic centerpiece. A single ended bath situates the tap and the waste at one end of the tub, making it ideal for a single bather to stretch out and relax. Choosing a double ended bath from the Subway or Loop and Friends ranges will offer the user total comfort or the opportunity to bathe with company as the taps and waste are centrally located. A double ended bath is also the ideal choice for a family with young children, giving them more room to bathe. For an elegant family bathroom or a sleek ensuite, a Villeroy & Boch inset bathtub will suit any design brief to bring you the best in German engineering, performance and durability with style. Characterised by its minimalist round and angular form, the Subway collection is suitable for a range of bathroom designs from chic contemporary to traditional with a modern twist. 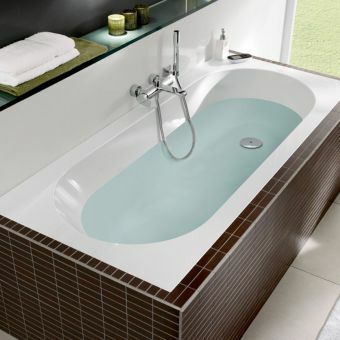 Subway bathtubs are fixed style tubs made from hardwearing acrylic for added convenience. Available in single and double ended configurations, and in sizes from 1600 to 1900mm, this style of bath is ideal where space may be limited but impact and style are required. 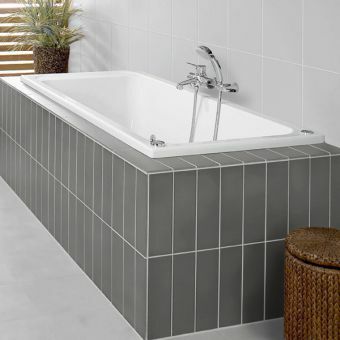 The slim and sharp profile of these bathtubs allows them to integrate seamlessly with a tiled surround. 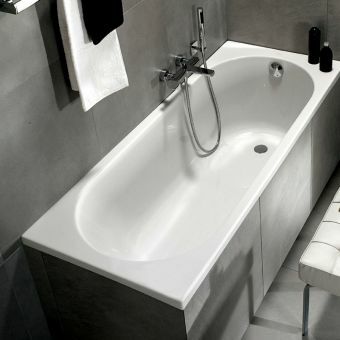 The O.Novo collection provides a modern organic shape with a classic single-ended bathtub. Made from acrylic, O.Novo will complement most bathroom styles and is available in two lengths - 1600 or 1700mm, and two widths - 700 or 750mm. This classic bathtub with its inset design is ideal for a functional yet beautiful bathroom with a fully integrated design aesthetic, and whether clad with panels or tiles will enhance an ensuite or a family bathroom. The ultimate in easy maintenance, the O.Novo range will continue to look beautiful for years to come. The Omnia Architectura collection combines classic design with a modern twist. 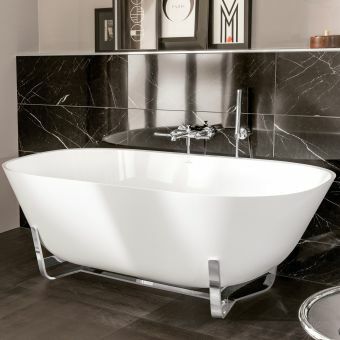 These rectangular bathtubs with a timeless appeal are available in multiple sizes, with lengths ranging from 1400-1700mm and widths ranging from 700-750mm. The Omnia Architectura collection is also reasonably priced, providing the opportunity to build a luxury bathroom on a tight budget and the generous range of available sizes mean it can be adapted to any design brief and individual need. 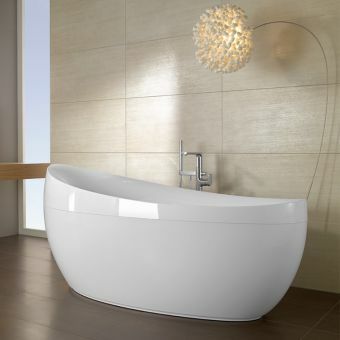 The Loop & Friends collection provides a range of fixed or freestanding bathtubs in organic and architectural shapes. Loop & Friends is characterised by minimalist elegant shapes and only the highest quality materials which will complement any bathroom. With their double ended configuration, the Loop & Friends collection delivers comfort with a fresh and clean aesthetic and may be fitted with a whirlpool on request for the ultimate in wellness bathing. 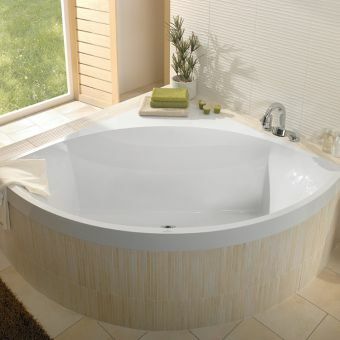 The Aveo range is the ultimate in freestanding organic shaped bathtubs. Its seamless design is a modern classic which can be seen gracing many stylish luxury bathrooms suites around the world. The Aveo is the ultimate in understated luxury. With a cocooning, egg shaped design that wraps around the bather, these baths are manufactured in durable Quaryl for the ultimate in tactility and performance. Marrying a contemporary design aesthetic, superb functionality and German engineering excellence, the Aveo is a high performance bathtub that makes the ultimate design statement in the larger bathroom. Manufactured from robust and innovative materials, the Squaro Edge 12 collection provides architectural design in both fixed and freestanding tubs for the ultimate focal point in the traditional or contemporary bathroom. The thin rim provides a sharp modern look and the wide range of sizes make the Squaro Edge 12 collection the perfect match for any bathroom where a sleek and bold aesthetic is required. The fixed bath version can be specified with either Graphite Noir or White aprons. The ultimate La Belle collection takes you back to an era of artistic romanticism: its sculptural shape could have been carved by Michelangelo himself. Available in both fitted and freestanding designs, La Belle is the ultimate in luxurious bathtubs and the perfect blend of continental craftsmanship and design. Moulded from Quaryl, these exceptional baths lend themselves equally to a contemporary or classic design brief and represent the ultimate in comfort and relaxation. Extremely tactile and svelte to the touch, these Quaryl tubs offer a safe and slip free bathing experience with superior thermal performance for the ultimate luxury soak. Exquisite form, exceptional functionality and superior performance all combine in a Villeroy & Boch bathtub making them the ideal choice for any luxury bathroom installation. If you require more help choosing your perfect V&A bathtub, we have specialists available to give free advice.